The majority of Nuer people originated from the Nile Valley region of South Sudan, with a smaller minority of their population also originating in southwestern Ethiopia. They are one people group among many in the Sudanese people group cluster (see below). Historically, they valued cattle, the highest symbolic, religious and economic value among the Nuer. Cattle were particularly important in their role as bride wealth, where they were given by a husband's lineage to his wife's lineage. However, despite having those experiences in Sudan, many work in the food service, retail, hospitals, hotels, and airport security in the United States. Culturally, Nuer received facial markings (called gaar) as part of their initiation into adulthood. The majority of Nuer reside in Nebraska, Minnesota, Sag Harbor, NY, Iowa, South Dakota, Tennessee, and Georgia. See Nuer Community of North America on Facebook. Pray Nuer Christians will boldly share the message of Christ. 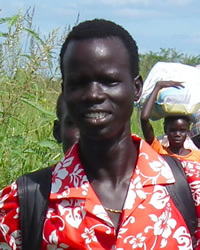 Pray Christians who encounter Nuer will show Biblical love in word and deed.